The human vibration meter PCE-VM 31 is designed for hand-arm- and full-body vibration measurements. Therefore the human vibration meter is certified according to ISO5349 and ISO2631. The human vibration meter is able to dermine acceleration, speed and distance. Furthermore it is possible to display all relevant values like current effective value (RMS), the maximum effective value (MTVV), the interval effective value, the vibration dose value (VDV), the vibration total value (aw), the peak value, the maximum peak value and crest factor (peak). 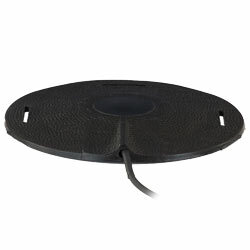 Additionally the human vibration meter possesses an additional measurement channel which might be used for SEAT-measurements on driving seats. It is also has the possibility to locate main frequencies via a three-channel FFT as well as a TEDS-support for automatic sensor-recognition. 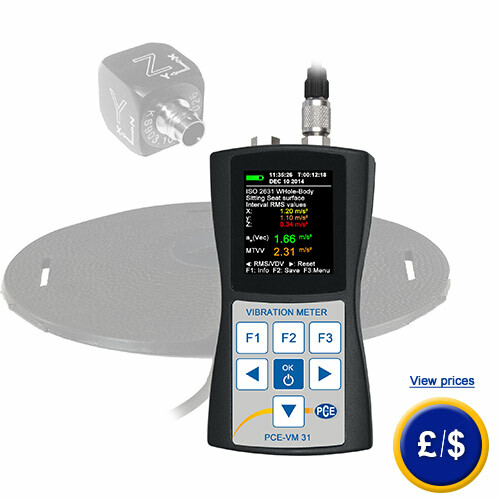 The human vibration meter is equipped with a storage facility for up to 10000 measurements and comes with a USB-interface in order to transfer the measured data to a computer. Thanks to the compact design of the human vibration meter, practical measurements can be made on the workplace directly. For further information on the human vibration meter PCE-VM 31, please read the following technical data or call our hotline: UK customers +44(0) 23 809 870 30 / US customers +1-410-387-7703. Our engineers and technicians will gladly advise you with the human vibration meter PCE-VM 31 or any other device in the field of measurment instruments, regulation and control or scales and balances of PCE Instruments. The daily exposure limit value is standardized on 5 m/s ² with a relative time of 8 h. The trigger daily value is standardised on 2.5 m/s ² according to the norms with a relative time of 8 h. The assessment of the proportion of exposure to hand and arm vibration is obtained by calculating the daily exposure time of 8 hours on the standard A (8). It is known as the square root of the sum of squares (total value) of the current values of acceleration with frequency assessment in three orthogonal directions ahwx, ahwy, ahwz (ISO 5349-1:2001). The assessment of the proportion of exposure to whole body vibration is obtained by calculating the daily exposure A (8). It is known as the constant acceleration equivalent to a period of 8 h, calculated as the higher of current values or the highest value of the vibration dose values (VDV) of the accelerations with frequency value in the three orthogonal directions (1.4 awx, 1.4 awy, awz for a worker sitting or standing/ISO 2631-1. The corresponding ISO standards may be obtained from the publisher or organisation that collects relevant DIN norms. The triaxial-accelerometer for the human vibration meter in the version of a seat cushion to perform full-body measurements. 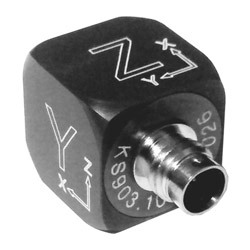 This triaxial-accelerometer for the human vibration meter is made to make precise estimations of the vibrations in hand and arm.